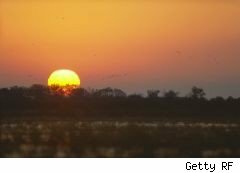 Daylight Saving Time begins Sunday, when for eight months people will be fooled into thinking that the extra hour of light will save them money -- or at least not much money. Last year at this time I wrote about how moving the clock forward an hour will get you more light during the day, but won't save you money because the extra savings gained in not turning on the lights for an hour in the evening was offset by people using more gas and turning on their air conditioners early, among other things. I won't go into those reasons again why Daylight Saving Time, or DST, is a scam as far as saving money, but I did a rough calculation to find out how much money I'd save by turning on the houselights one less hour per day. The bottom line:1 penny saved. That's how much it costs to run a 100-watt lightbulb for one hour if electricity costs 10 cents per kilowatt hour. To get to the $12 savings, actually $11.90, took a little more math. Saving 1-cent per hour for a 100-watt bulb would add up to $2.38 during the entire period of Daylight Saving Time this year -- from March 14 to Nov. 7. In my house at night I might have three or four lights on, but let's just say for argument that the average home has five bulbs burning at night. Five bulbs multiplied by $2.38 in savings equals $11.90. That's it: Just $11.90 in saving for the year by turning five light bulbs on an hour later every night for eight months. And I could be considered generous in that amount, since electricity prices vary by state and 10 cents for a kilowatt hour is above the norm. The average residential price for a kilowatt hour is 7.71 cents in Kansas, 12 cents in California, 14.31 cents in New York, and 7 cents in Oregon. Some utilities have cheaper rates in the evening, so some people could get a bigger discount for leaving the lights off for an extra hour. Using compact fluorescent lightbulbs uses less energy, and thus can cost less to use. But don't be fooled by the idea that Daylight Saving Time is a good way to save money. You might save $12 on lighting your home, but turning on the air conditioner will quickly eat up that savings.